As one of the biggest days in any couple’s life, it’s important to choose a wedding food menu which fits in with the tone you want to set for the day, whether that’s relaxed and informal, or adding a bit of theatre and excitement. For this event, we provided both food and staff to help the couple add a unique and special feel to their wedding reception. We met this couple at one of our tasting days which help others to get a feel of the type of menus we can create, a flavour of the food and presentation we can deliver and ask us any questions they like. After being impressed with what we had to offer, they booked us for their October wedding at a beautiful venue in Surrey. They asked for their guests to be served canapes, a main course, dessert and evening snack. There would be 160 wedding guests attending, so ensuring they would all be served in good time was essential as it was a sit down meal. Therefore, we planned a platter service for the main which would allow all the guests to receive their food as quickly and efficiently as possible. As we were offering a full catering service from canapes through to the evening snacks, it was important to plan everything to perfection. We provided all the waiting staff and bar staff, as well as a front of house manager to oversee the day and ensure everything ran smoothly. 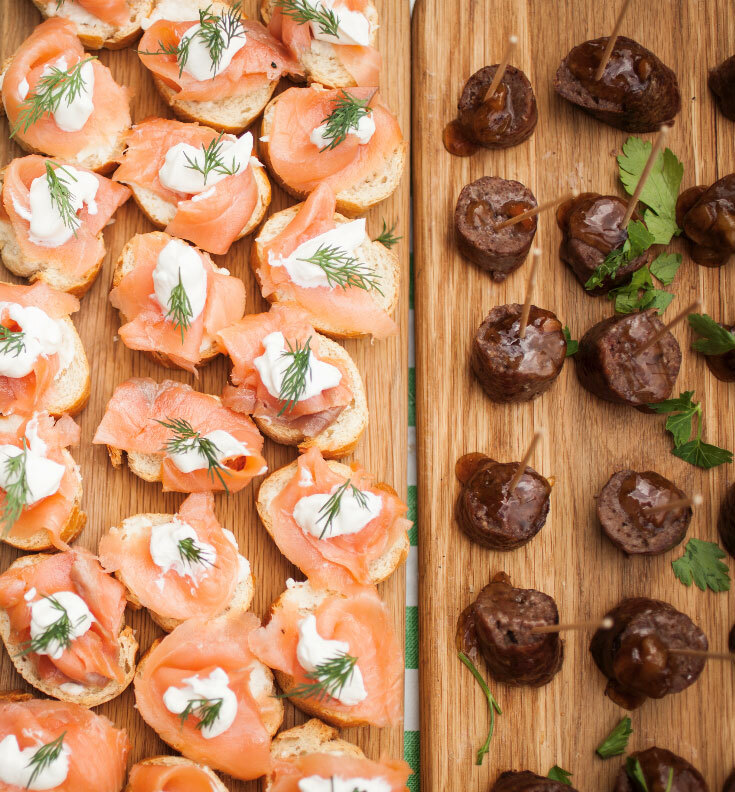 Guests received delicious canapes upon arrival at the reception, alongside champagne and prosecco. We brought out the hog roast main dishes as sharing platters, including salad bowls and bread baskets in a banquet manner. This type of serving and presentation suits hog roast style catering at an event like this. It makes your loved ones feel really looked after without feeling as stuffy as a silver service. This helps guests relax, creates a buzz and adds to the exciting atmosphere, making it a truly memorable day. Desserts were plated and served, followed by tea and coffee to leave guests feeling more than satisfied. We also provided evening snacks which were served at 8pm, hitting the right spot during the evening celebrations. Our client left the following 5* review of our services. Thank you so much for an amazing feast at our wedding! Marco and the team were a pleasure to have at our wedding and we’re so grateful for all the personal and professional time and effort they gave us in organising the various logistics and coordinating leading up to our wedding. 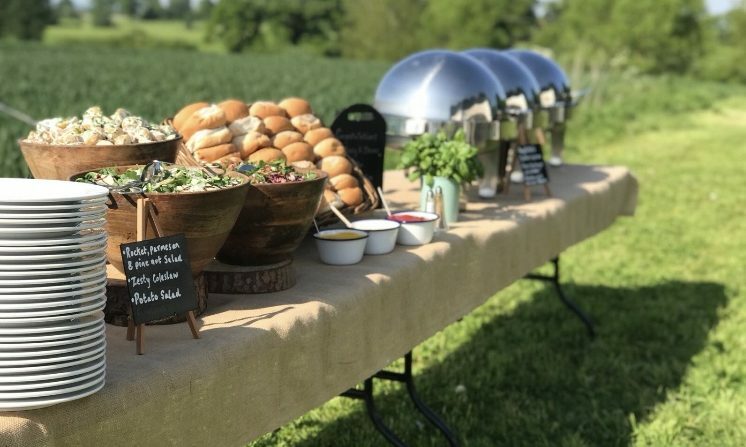 The food was really delicious and unique – all the way through from canopes to delicious hog roast dinner to the evening snack, and we got so many compliments on the food both during and after the wedding for a lot of our impressed guests! We had the best day – and the delicious food played a big part in that! Thank you so much for to Marco all the team at The Gourmet Hog Roast Company – looking forward to a booking in another fixture in the future! 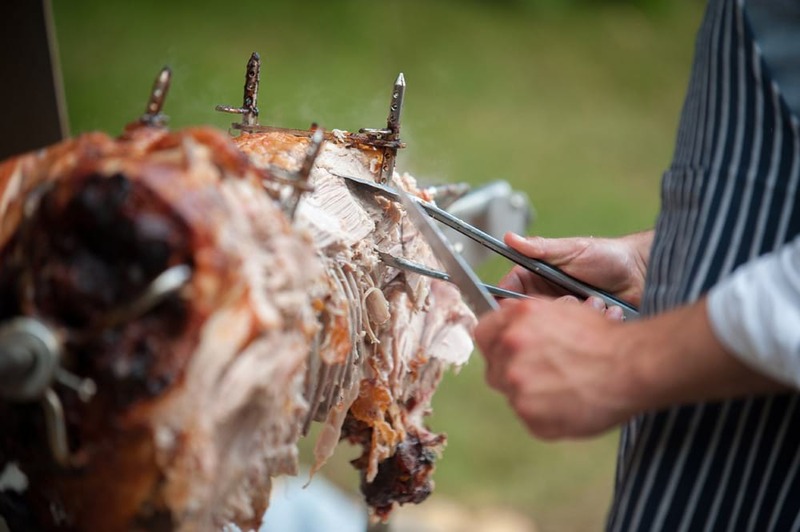 We provide hog roast menus for weddings across London, Surrey and the South East. If you’d like to try some of our delights and meet us in person, come to one of our tasting days. Our next one is coming up on 30th March 2019 at Bonhams Barn in Holybourne, Alton. We’re a preferred supplier at this amazing wedding venue. Alternatively, get in touch now to speak to our team.